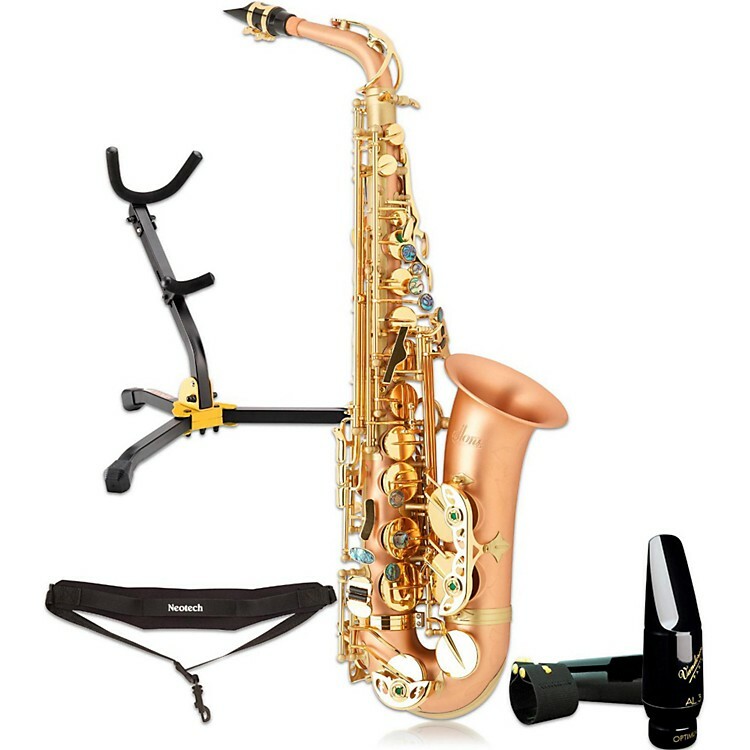 Professional alto with a quality accessories package. The Allora Boss 2 Alto saxophone has continued the tradition of the original Allora Big Boss by providing a great vintage jazz sound. Returning to a more traditional bell size has allowed for a more direct sound with more "core". Features include professional style keys, abalone fingerbuttons, rolled tone holes, double arms on Low C, B, and Bb keys, and a high F# key. The traditional copper body and vintage look are still present, but are now accompanied by the addition of a vintage style solid nickel silver finish option as well. Both models achieve that great dark sound associated with certain saxes from the 30's and 40's. Comes with contoured case. A generous accessories package is included. Order today and receive an instrument of professional quality along with essential accessories.